Zomato is a restaurant search & discovery service founded in 2008. It currently operates in 23 countries, including India, Australia & the United States. It features restaurant information such as scanned menus & photos sourced by local street teams, as well as user reviews & ratings. The company also provides cashless payment, online ordering, white-label apps, table reservation, & point-of-sale systems. Currently Zomato enjoys unicorn status, with a valuation of approx. $1billion. Explore every restaurant in your city, & use search filters to find the one that suits you best. View menus, pictures, phone numbers, directions, user reviews, & all the necessary information you need to dine out, get a delivery or a takeaway. In-app table booking (selected locations) – you can view & book yourself a table at all partnered restaurants. App Design: Zomato like app needs an engaging design & an intuitive user experience to gain customer retention. It requires the use of advanced technologies and tools, however it’s totally worth the try. App Platform (Android, iPhone): The app development cost varies from platform to platform, depending upon the features and functionalities. You should choose wisely as per your target market. App Size: The total number of features & functionalities decides the app size. We can always go for a Minimum Viable Product (MVP) in the early stages, & then take it from there. 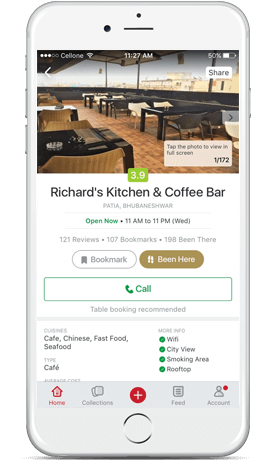 Andolasoft, a global web & mobile apps development company based out of USA with offshore in India can help develop ZOMATO like apps that could trigger results for start-ups.